After throwing a Shut-Out last night, Ubaldo Jimenez is now 10-1 with a 0.78 ERA on the season, a season in which he has also thrown a no-hitter! The "Rocky Mountain Rocket" throws 98-MPH with a surreal 9-inch break and could be the first pitcher in history with a realistic chance of breaking one of the game's legendary marks, Bob Gibson's single season ERA record of 1.12. Below we look at 5 of the best Ubaldo's money can buy. If there doesn't happen to be a Bowman rookie auto of a player, the next logical step is to search for an SP Authentic rookie auto. That is the case with Ubaldo's best RC. Before Upper Deck fell to pieces, SP Authentic was an industry standard and one of the finest cross-sport products of the last 15 years. The SP Authentic Ubaldo Auto RC is a must. Ultimate is a brand of class, sophistication, and taste. There is something oddly intriguing about the upper echelon Upper Deck offering. It feels like the cards were meant for Kings and Queens, but are far too tacky looking for royalty, which is the charm of Ultimate. 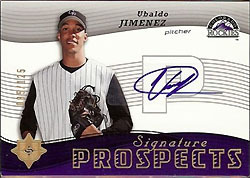 With a print run of 125, the Ultimate is one of the best investment Ubaldo's on the market. Usually, SPx is one of the my least favorite brands. The sticker drops and "sherzee" swatches make the cards look more like a school project than a sports card. However, the 05 SPx Ubaldo is actually pretty solid looking, the card was well conceived and carries a print run of 185 like the SP Authentic. 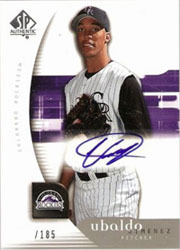 Leaf Limited has 2 Ubaldo's in it's 2005 base set, both autographed and numbered to 99. The reason these make the list is because they are sharp looking, underbooked, and carry the lowest print run of any Ubaldo Auto RC. Although neither will ever top the SP Authentic RC, the low book value makes for an amazing investment opportunity. What would any respectable baseball countdown be without a Bowman or Topps Auto RC? 2007 was one of the best looking seasons for Topps Chrome. The great thing about Topps products is that it gives collectors of all tax brackets an opportunity to buy in. At $30, this card is a great deal. If this card is a bit too cheap for your taste, go for a finite refractor. Brett is a former contributor to The Cardboard Connection.